The tenants at this Little Haiti apartment were asked to move out so the owner can demolish it. It's among the few remaining affordable rental buildings in the neighborhood. Silionord, 80, has many complaints -- the cockroaches crawl freely across the floors and raccoons sometimes make their way through the hole in his floor -- but it’s a place to sleep that he can afford with his monthly Social Security check. He and the four other families that live in this small two-story apartment building all pay under $1,000 a month for rent, but now they’re being asked to leave. Their landlord mailed them the required 30-day notice to move out and has plans to demolish the building. Buildings like this one--small multi-unit apartment buildings that charge well below market rate for rent-- are quickly disappearing from rapidly gentrifying neighborhoods like Little Haiti and West Coconut Grove. These structures are typically in disrepair, but when the working-poor families or seniors living on meager Social Security checks in these apartments are confronted with leaving it becomes a vexing pursuit to find a place they can afford. According to the Urban Institute, from 2010 to 2015 Miami neighborhoods saw a significant reduction in “naturally occurring affordable housing,” rental units that had no government subsidies and charged below-average rent. In Edgewater, for example, in 2010 around 63 percent of rental units were below $1,000, but by 2015 that number had plummeted to 23 percent. Little Haiti, Overtown, West Coconut Grove and Liberty City are also starting to see units at that same price point disappear. One of the driving forces behind this trend is renewed interest in the urban core, which has brought with it major development projects in neighborhoods that weren’t always considered desirable. Just one block away from the Little Haiti apartment building that will soon be demolished is the site of Magic City, a multi-million-dollar innovation district with plans for co-working spaces, 2,500 residential units and retail space. “It drives up appraisals and rents in the rest of the neighborhood,” says Annie Lord, executive director of the nonprofit Miami Homes For All. She says cheap, non-subsidized rental buildings are part of the affordable housing eco-system and should be preserved, but that will take a mix of strategies, from community land trusts that can purchase buildings from owners interested in selling to providing government subsidies to rehab aging buildings in exchange for maintaining more affordable rent. Claire D’Ayiti, 60, lives in the Little Haiti building that’s about to be demolished. She says she had to borrow money to come up with the first and last month for a small one-bedroom apartment nearby, about $1,600. Tenants say the downstairs ceilings leak when the upstairs neighbors flush their toilets. 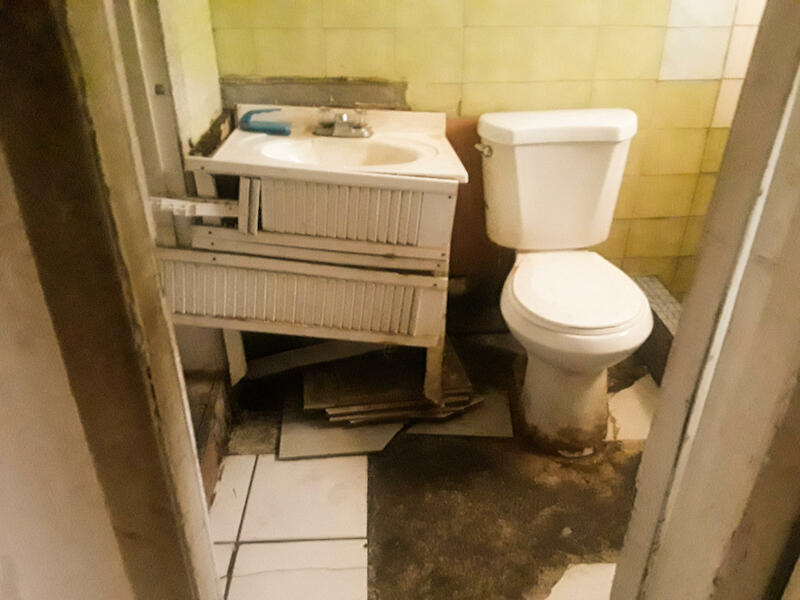 D’Ayiti says the Little Haiti apartment building was barely liveable as it was and the landlord took advantage of the tenants by never fixing up the place because he knew they were too poor to just pack up and leave. “It’s an injustice,” she says. 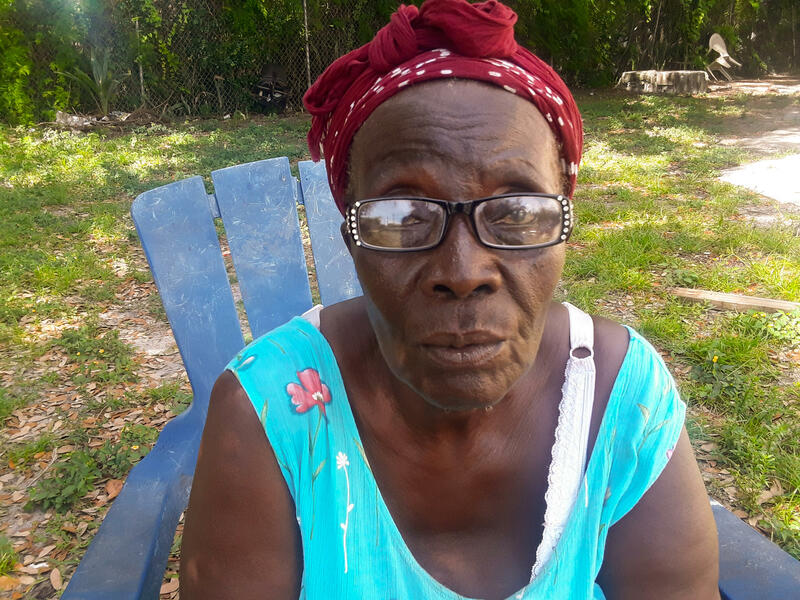 She described an incident on Good Friday when she was cooking a pot of sos pwa blan, white bean puree, to accompany a dinner of white rice and fried whole snapper and a rat fell from the ceiling into the pot of beans. Adrian Madriz, an organizer with a group called Smash the Slumlords, said the experiences of the tenants in this Little Haiti building is something he’s seen in other Miami neighborhoods. And another common attribute is that the owners typically have code violations or are operating illegally. For example, in this Little Haiti building, the owner doesn’t have a certificate of use to operate as a landlord. City of Miami records show he owes more than $30,000 for failing to get the certificate. “These landlords, they know if they apply for the certificate the city is not going to give it to them because in order to get it they have to meet minimum building standards,” he says. The tenants in the Little Haiti building had a deadline of June 30 to move out, but as of mid-July some of them were still there still trying to figure out where they’re going to move to. On July 1, the day after the move-out deadline, someone came by and nailed plywood over the remaining tenants’ doors with all of their things still inside. That’s illegal, according to Florida tenant laws. The residents removed the plywood and went back into their spaces. Rosemond, who recently had prostate surgery, says a few days ago he was served with an eviction notice because he has overstayed the deadline to leave. He’s hoping the eviction process buys him a little more time. He thinks he's found someone who will let him rent a room inside their home for $425 a month. He adds he also started the process to get a Section 8 voucher and signed up for senior housing, but the people at the nonprofit he’s working with told him that the process from application to getting into a government-subsidized home can take years. Gertrina Joseph, 76, says her apartment was subpar, but affordable. Now faced with moving out, she says it's hard to find an affordable place. Gertrina Joseph, 76, was also looking for a place to go. She says people from her church are helping her look too. The showerhead inside her bathroom hasn’t worked for months. She uses the bottom bathtub faucet to fill up a bucket and that’s how she bathes. Her knees are bad she explains, so she has to be extra careful that she doesn’t fall. She says she hopes to find a place that’s more comfortable than this one. Most of her things are already packed. “Except my bed, because I still need to sleep somewhere,” she says. A few social service nonprofits have stopped by to check in on the tenants, but she says the news is all bad. Long waiting lists for government housing and basically nothing for rent for at what she can afford— $500 a month. Someone gave her a number on a torn piece of white piece of paper and told her to call it to find housing assistance. It was to Camillus House, a homeless shelter.